A powerhouse group of UNLV Executive MBA alumni is overseeing and managing essential operating aspects of MGM Resorts International’s newest $960 million property in Springfield, Massachusetts. From CFO to Guest Experience Director, this impressive collection of highly motivated and successful UNLV graduates talk about their EMBA experience and its effect on their professional development and career trajectory. 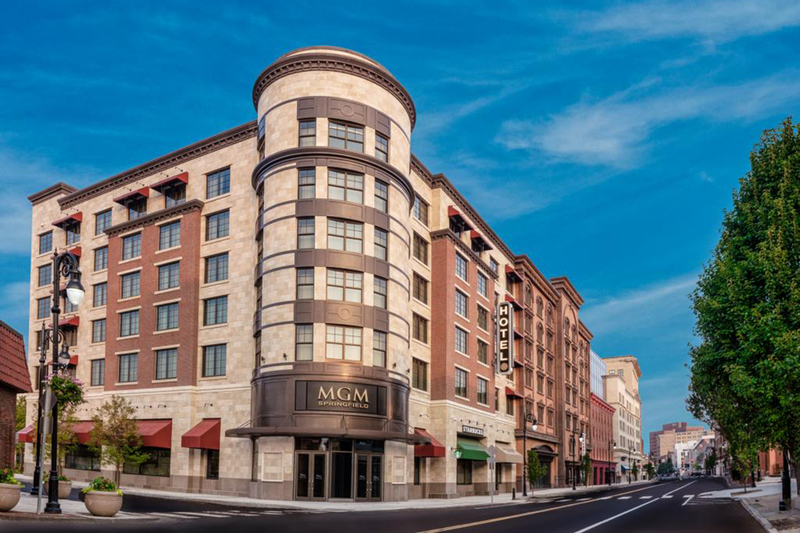 Under the leadership of UNLV EMBA graduates, MGM Springfield opened late August 2018. The new resort/casino is located in the heart of downtown Springfield, Mass. Covering three city blocks, the property is igniting a cultural and economic renaissance in this historic New England city. The approximately two million square-foot development features new construction combined with the revival of historic buildings and includes more than 125,000 square feet of gaming space, a 250-room boutique hotel, spa services, diverse retail and dining headlined by award-winning Chef Michael Mina’s Cal Mare. MGM Springfield also features a seven-screen Regal luxury cinema complex, bowling lanes, a seasonal skating rink and outdoor marketplace displaying local art, events and talent. One of the first members of the MGM Springfield executive team to be hired, Wenleder directs and oversees the strategic financial planning, operational performance and financial management of the new property. She began her UNLV EMBA experience with Cohort 4 during which time she was promoted to CFO of Beau Rivage Hotel and Casino, Biloxi, MS. Wenleder intended to commute from Biloxi to Las Vegas to complete her studies, but hurricane Katrina hit the Gulf Coast, severely limiting her time availability. When she received a promotion to New York - New York as VP of Finance/CFO, she completed the UNLV EMBA program as a member of Cohort 7. Twenty-three years ago, Perez began his MGM Resorts International career in accounts receivables/payables. Since 2008, he has served as Hotel Controller at Bellagio and Executive Director of Financial Projects at CityCenter. Since receiving his UNLV Executive MBA, Perez has held the positions of VP Finance & CFO at Beau Rivage Resort & Casino in Biloxi, MS. He was promoted to his current role in 2014. Since graduating from the UNLV EMBA program in 2012, Peters’ career has been on the fast track with four promotions. Prior to accepting her current position as Vice President – Projects and Integrations, Peters served as Vice President of Finance – Regional Operations; Executive Director - Client Services and Executive Director Non-Gaming Audit and Accounting. From 2004 – 2011 she held the position of Property Services Director at CityCenter. Eight months following graduation from the UNLV Executive MBA program, Cohort 13's Ashley Farkas was promoted to Executive Director of Public Relations at MGM Resorts International. Since then she has managed media relations for the opening of Morimoto Las Vegas at MGM Grand and was also selected to be on the Task Force team to open MGM National Harbor, a $1.4 billion resort in the Capital Region. Farkas and her Public Relations team were responsible for the PR strategy for MGM Springfield which resulted in hundreds of media stories supporting the resort's opening. A 2016 graduate of the UNLV EMBA program, Muna has served as Director of Finance – Regional Operations since June 2018, a position to which he was promoted following 19 months as Director of Finance Project Development with Park MGM. Joining MGM Resorts International in 2002, Muna has held numerous corporate positions including Director – Business Relationship Management and Director of Finance – Analytics Services. Early in his MGM career, Muna was Director of Finance with CityCenter Residential and Senior Staff Accountant at Bellagio. As Director of Guest Experience for MGM Springfield, Fyler is helping to create a culture that exemplifies the MGM experience. Fyler was promoted to his current position after serving as Front Services Manager with Circus Circus. Previously he held the position of Public Area Manager with Excalibur. What do you consider the most valuable ROI in regard to your UNLV EMBA? Wenleder: Because the EMBA program is so intensive, it helps you to understand and believe you have the capacity and confidence to take on more responsibility and succeed. You can handle much more stress than you ever thought possible; stretch your talents and skills; and succinctly prioritize to help ensure efficiency and success. That confidence level and new skill sets were put to the test in my position as Vice President of Finance in Biloxi when it was necessary to rebuild after Katrina. That experience in Biloxi was more than a job, more than just being a CFO in a casino. It was helping the community, giving them hope, rebuilding and working as a team. Perez: Knowledge is power and obtaining my EMBA gave me the confidence to pursue larger and more challenging roles. Topics such as organizational behavior, corporate strategy, macro-economics and learning about leadership greatly enhanced my ability to think strategically and improve decision-making. Muna: Three areas top the list. The network of alumni, especially at MGM Resorts International; new skills that I immediately used in both my professional and personal life, especially negotiations and executive presence; and self-awareness of my strengths. Prior to starting the UNLV EMBA program, I was considered by many as “quiet.” The self-awareness and confidence I gained from the program empowered me to know that I had a great deal to offer and others could benefit from my knowledge and leadership. Fyler: The cohort experience is one of the greatest ROIs of the program. I still talk to many of my Cohort 15 family on a regular basis, as we all continue to grow in our respective fields. It’s incredibly helpful to have such a diverse background of trusted advisors. Peters: The Executive MBA program prepared me to think creatively and problem solve more soundly. I gained new confidence in my business acumen and ability to solve demanding management problems. Before enrolling in the EMBA program, I had a fair understanding of the strengths and weaknesses of my leadership skills. But what the program taught me about leadership was invaluable. Did obtaining your UNLV EMBA change your career trajectory? Peters: Yes, definitely. When I entered the program, I was a property services director in the Finance Shared Services Center and eager to advance within MGM. One month after starting the UNLV EMBA program, I was promoted to Executive Director for Non-gaming Audit and Accounting in 2011. Since then, I’ve received three promotions and relocated from Las Vegas to Washington D.C.
Perez: Definitely yes. My first promotion post-EMBA was Vice President Finance & CFO at Beau Rivage, which required a post-graduate degree. The EMBA curriculum provided me with foundational knowledge in areas such as macro-economics, corporate strategy, leadership, organizational behavior and information technology, all of which have proven critical in my recent roles. What is your top advice for aspiring UNLV EMBA students? Perez: The program is not about getting a passing grade, it’s about genuinely wanting to invest in your cognitive growth. Stay focused, work hard on your projects, show leadership and teamwork, and have fun. Wenleder: You get out of the program what you put into it. It goes by very quickly, so invest your time and energy into building relationships with fellow cohort members and savoring every opportunity to learn from both professors and classmates.